It would be astounding for any candidate to admit, even privately, 10 days before the election that “if we don’t [win], that’s okay too.” It’s especially mind-boggling — and especially irresponsible — for a candidate to believe that privately, and then tell his supporters, publicly, that electing him is their country’s last chance. Note then the Vox standard for balancing the conflict between the private and public statements of the two candidates: for Clinton, we're only supposed to focus on the public statements, but for Trump, all the action is in his private statements. And note again, the lack of a theory on how the public filters information; there is no discussion anywhere of how Trump (or Clinton) supporters assess the intentionality of their preferred candidates statements. To be fair, it's an especially bewildering weekend in Vox world, with the presidential campaign consumed with trying to understand how the public processes information that they don't have, related to the Clinton Abedin Weiner mess. If only the public statements mattered to the public, this wouldn't be a problem! It was Lord Attlee, in a few crisp remarks on television, who put the whole matter in its proper setting. He was asked if he would have handled this in the same way as the then Prime Minister. He said "No, I do not think I would." Asked what he would have done differently, he said "I would have handled it myself." Asked about the question of guilt and innocence, he simply said, "Ministers of the Crown should not go round with people of that kind." Saudi Arabia had a very successful bond sale of nearly US$18 billion recently. The money will help finance the overall budget which means that in principle it's financing anything in that budget, such as for example the war in Yemen. Interesting example of the blind spot in Irish anti-war sentiment. It focuses on the use of Shannon airport by military flights. Those Saudi bonds: they're listed on the Irish Stock Exchange. Among the many puzzles of the post-Brexit referendum "debate" is the obliviousness of the establishment to the mess they've created. And there's a circularity to the celebrations that no economic effect is yet apparent in growth rates -- an uncertain event that has not taken form is unlikely to manifest itself so directly. Anyway, left is the Telegraph website most read articles as of lunchtime on Friday. With the public getting what the public wants on what they read, why would anyone expect Brexit consequences to get a coherent discussion? Some dream of a new Whig party that unites modernist Tories, New Labour remnants and market-minded Liberal Democrats, like fantasy football enthusiasts itching to team up Mesut Ozil and Kevin de Bruyne. We condemn in the strongest possible terms the Asad (sic) regime's defiance of the longstanding global norm against chemical weapons use and Syria's abrogation of its responsibilities under the Chemical Weapons Convention, which it joined in 2013. The Syrian regime has violated the Chemical Weapons Convention and UN Security Council Resolution 2118 by using industrial chlorine as a weapon against its own people. October 31 marked a major milestone in our determined effort to get rid of Syria’s chemical weapons program. The Organization for the Prohibition of Chemical Weapons (OPCW) announced it is now confident that no additional chemical agents or munitions can be produced in Syria... In the end, Syria will be held accountable for the safe and swift elimination of its chemical weapons program and for full compliance with UN Security Council Resolution 2118, OPCW Executive Council decisions, and the Chemical Weapons Convention. Also, it's forgotten now in a haze of chlorine, but OPCW won the Nobel Peace Prize in 2013. It's almost as if a purpose of the financial sector is to provide a career holding pattern until the upper class chips get cashed in! When Romney thinks he's behind closed doors and he's just telling other people like him how politics really works, the picture he paints is so ugly as to be bordering on dystopic. It's not just about class, but about worth, and legitimacy. His voters are worth something to the economy -- they're producers -- and they respond to legitimate appeals about how to best manage the country. The Democrats' voters are drags on the economy -- moochers -- and they respond to crass pay-offs. Romney doesn't voice these opinions in public. He knows better. But so did the voters. That's what you see in the overwhelming rejection Romney suffered among African-Americans, Hispanics, Asians, and young voters. They sensed that Romney fundamentally didn't respect them and their role in the economy, and they were right. So even if Klein says the focus on private statements didn't matter because the voters knew it anyway, his logic then falls apart because he can only say in retrospect what the voters knew because of the revelation of the private statements. The underlying issue here is the New Pundit Lacuna in having a theory of how the public filters information and which statements they choose to believe. Hence in Vox land, Romney's private statements were the real Romney, but the public Clinton statements are the real Clinton. The European Union's lead Brexit negotiator wants British and EU officials to work in French rather than English during the divorce talks, an EU official familiar with Brussels' Brexit task force said on Friday. Michel Barnier, the former French foreign minister running the complex separation with London, is keen that his native tongue be used in meetings and documents, the source told Reuters during a EU summit at which Theresa May was making her first appearance as prime minister at the European Council. "Barnier wants French to be the working language in Brexit negotiations with Britain," the source said. Jameson’s appeal comes from being an easy-to-drink whiskey that “doesn’t take itself too seriously,” said Jean-Christophe Coutures, chief executive of Pernod’s Irish Distillers unit, which also includes other Irish whiskey brands such as Redbreast and Powers. 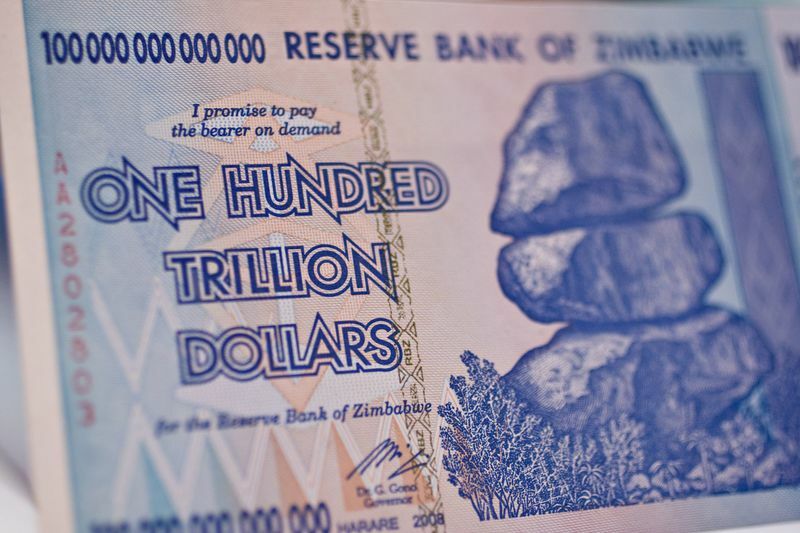 A banknote from the tremendously huge inflation era in Zimbabwe in 2008, which citizens fear could be coming back. Photo and story via Bloomberg News. Irish and Greek Prime Ministers Enda Kenny and Alex Tsipras at the European Council meeting today in Brussels. If you were using economic conditions to judge on the basis of negative relationship which of the two countries is more likely to have a Winter of Discontent, you'd be wrong. Photo: Media service of European Council. The press, by signal-boosting these disclosures, makes these accusations more credible to voters who don’t really understand that these disclosures, however problematic, don’t bear on the fundamental fairness of the November election. They just see plotting and conspiracy ... Russia’s strategy is even more dangerous that it appears. Not only does it undermine democracy using the press but it actually gets the press to undermine itself. And there’s not much we can reasonably do about it, either ... The press may end up unintentionally propagating false information, even if it reports denials by the targets alongside the fake revelations. That undermines its role as societal truth teller and thus the public’s already damaged faith in the press’s honesty. But you can print a newspaper telling them what they need to know about what happened on Monday. The constraint of newness was crucial. The web has no such limits. There's space to tell people both what happened today and what happened that led to today. But the software newsrooms have adopted in the digital age has too often reinforced a workflow built around the old medium. We've made the news faster, more beautiful, and more accessible. But in doing we've carried the constraints of an old technology over to a new one. Today, we are better than ever at telling people what's happening, but not nearly good enough at giving them the crucial contextual information necessary to understand what's happened. We treat the emphasis on the newness of information as an important virtue rather than a painful compromise. And so Vox would be about context -- ideally backed up by data -- and not just about newness of information. Now we learn that the media can't be trusted with all that limitless Web of information, because they'll pluck out the most awkward parts and undermine their long-standing role as truth-tellers, who managed to do all that truth-telling despite the False God of newness! The deeper problem for the New Pundits at Vox, as any sociologist could have told them long ago, is that with information overload, everyone, individuals and institutions, has filters for determining what is "news." Data-informed context was supposed to be a superior filter, but that only moved the problem up one layer, and did nothing to end the circularity of which political news is relevant. And in that void, political preferences, still, come to the fore. Personal relationships have long been the bedrock of American-Saudi relations, yet the Obama administration has struggled to find someone to develop a rapport with the prince. The job has largely fallen to Secretary of State John Kerry, who has hosted the prince several times at his home in Georgetown. In June, the two men shared an iftar dinner, breaking the Ramadan fast. In September 2015, dinner at Mr. Kerry’s house ended with Prince bin Salman [sic] playing Beethoven on the piano for the secretary of state and the other guests. In May, the prince invited Mr. Kerry for a meeting on the Serene, the luxury yacht he bought from the Russian billionaire [Yuri Scheffler]. His desire to reimagine the Saudi state is reflected in his admiration — some even call it envy — for the kingdom’s more modern and progressive neighbor in the Persian Gulf, the United Arab Emirates. He has influential supporters in this effort, particularly the crown prince of Abu Dhabi, Sheikh Mohammed bin Zayed Al Nahyan, who for more than a year has been promoting Prince bin Salman [sic] in the Middle East and in Washington. Crown Prince bin Zayed [sic], the United Arab Emirates’ de facto ruler, is a favorite among Obama administration officials, who view him as a reliable ally and a respected voice in the Sunni world. But he also has a history of personal antipathy toward Prince bin Nayef [sic], adding a particular urgency to his support for the chief rival of the Saudi crown prince. In April of last year, Mr. Obama’s national security adviser, Susan E. Rice, led a small delegation of top White House officials to visit Prince bin Zayed [sic] at his home in McLean, Va. During the meeting, according to several officials who attended, the prince urged the Americans to develop a relationship with Prince bin Salman [sic]. The same White House officials who ostensibly disdain Gulf influence on think tanks have no problem giving direct audiences to the same people. When it eventually comes time to explain the barren landscape that is this administration's achievements with Arab countries, the claim of having moved outside the bubble won't be an excuse. Side note: we've reflected above the abysmal naming convention for Gulf princes followed by the NYT article (i.e. omission of their first name), which makes it impossible to know which prince they're talking about. Despite skepticism in Washington about the wisdom of the campaign, the Obama administration threw its support behind the Saudis, in part because it needed support in Riyadh for the nuclear deal it was then negotiating with Iran, a bitter enemy of Saudi Arabia. The playing down of the costs of the Iran deal in terms of its impact on US policy towards Arab conflicts is one of the big omissions in assessments of the deal. For example, it is never mentioned in the Vox explainer style article on the US role in Yemen. The brutal truth is that Brexit will be a loss for all of us. There will be no cakes on the table. For anyone. There will be only salt and vinegar. Reuters -- Egypt's armed forces will hold joint military exercises with their Russian counterparts on Egyptian soil for the first time from Oct. 15-26, Cairo's military spokesman said on Wednesday. Days ago Egypt backed a Russian resolution in the U.N. Security Council on Syria that removed the demand for an end to air strikes on Aleppo stipulated in an alternative French resolution. ... The joint military training will include drills between Egyptian and Russian paratrooper units in the northwestern region of el-Alamein, Egyptian military spokesman Brigadier General Mohamed Samir said in a statement posted on the Egyptian military's official Facebook page. 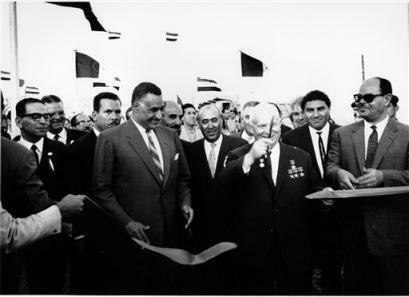 Above, Nasser and Khruschev cutting the ribbon at the Aswan Dam in 1964. It seems that the Obama administration view is that since Russia is a declining regional power, nothing bad is likely to happen when it forms closer alliances with large Arab countries. Three years after the above photo, Israel redrew its borders, aided in part by Egypt's misreading of its own relationship with the USSR. The plummeting pound is threatening UK households’ supplies of Ben & Jerry’s ice cream and Marmite spread, as Tesco, the country’s biggest supermarket, pulled dozens of products from sale online in a row over who should bear the cost of the weakening currency. Unilever has demanded steep price increases to offset the higher cost of imported commodities, which are priced in euros and dollars, according to executives at multiple supermarket groups. SUBJECT: Presidential Determinations with Respect to the Child Soldiers Prevention Act of 2008 Pursuant to section 404(c) of the Child Soldiers Prevention Act of 2008, as amended (CSPA) (22 U.S.C. 2370c-1), I hereby determine that it is in the national interest of the United States to waive ... in part the application of the prohibition in section 404(a) with respect to South Sudan to allow for the provision of IMET, PKO assistance, and support provided pursuant to section 1208 of the National Defense Authorization Act for Fiscal Year 2014 (Public Law 113-66), to the extent such assistance or support would be restricted by the CSPA. In other words, the US government wants to continue military training and expenditures in support of peacekeeping to the government of South Sudan which would otherwise be blocked by the Child Soldiers Prevention Act because there's clear evidence of South Sudanese government forces using child soldiers. Note: the sense of impunity in South Sudan is so pervasive that Americans were specifically targeted for violence in July, while existing peacekeeping forces did nothing about it. But with the help of a sneaky memo, US military aid will continue. The final assessment of Obama-era foreign policy will be a long one. South Sudan will on that list as a massive failure for which no one else -- not Russia, not a past invasion, and not a past obsession with the Middle East -- can be blamed. One challenge with implementing those contracts is that modern society restrains the idea of doing really crazy stuff when an unlikely outcome which is probably but not definitely attributable to underperformance happens. Thus, having a crazy guy in charge of the country who just might do something previously considered unacceptable could be the first-best solution! If all this develops as I expect — badly — the economic case for an Irish exit would strengthen. Ireland might choose to stay in the EU for political reasons. But those in Ireland in favour of EU membership should give some thought to what could go wrong. They might otherwise end up in the same place as the overconfident Remain supporters in the UK: bitter and without influence. Leaving aside that the debate needed a stiff drink to cope with, one surprise from the evening is that for all the anticipation that Trump's relationship with his running mate Mike Pence would be strained over the tape or his erratic policy stances, there is now a large divergence between them on Syria. Meanwhile Hillary's Syria policy contains a combination of infeasible proposals (an no-fly zone that would result in an air war with Russia) or else is identical to the current Obama policy (attacks on ISIS in Iraq and eastern Syria, special forces, and support to Arab/Kurdish forces). It's going to be a long winter in Aleppo. But this is not a relatively newsless campaign like 2012, which was full of overhyped “game changers” that didn’t move the polls. Instead, there’s been a lot of news in 2016 — almost too much to comprehend or consume at once. That can make it hard for stories to metastasize. But when a story has broken through to dominate the news cycle, it usually has moved the polls in the direction that people expected. Note the circular logic: news has moved the polls when it's been big enough to break through the noise and ... move the polls, and we know which stories these are because they're the ones that ... moved the polls! A problem with the quantitative approach to political campaign analysis is the lack of any theory of selectivity i.e. how the voter is processing the vast amounts of information out there with signals of very low quality. Thus with the Trump tape, simple explanations (now the voters have clear evidence of the private Trump) are overlooked in favour of stories aligned with preconceived notions (which is not to say they're wrong) about the awfulness of the Trump base and the cynicism of the Republican leadership. It's an obvious question: Why did the revelation of the Trump/ Billy Bush/ Access Hollywood tape do so much more damage to his standing than all the previous controversies? One answer: because the tape was definitive information about Trump's private behavior. This private-public distinction has been lost in the analysis of Trump's track record. Although there've been recurring reports of his personal unpleasantness, the big cycles of controversy have been around statements he made to public audiences or to well-documented dubious acts (e.g. his obsession with Alicia Machado's weight was on TV but his insults to her were not on tape, and his statements to Howard Stern were made to Howard Stern's massive audience for whom such language is part of the appeal). The secretness of private remarks and private knowledge makes them inherently tempting. But whether for pundits or politicians, there’s an important sense in which the public statement is the key one. Clinton can say whatever she wants to a private room of Brazilian bankers and it will in no way constrain her scope of action in the future. By contrast, when Clinton makes a public commitment to change the regulatory interpretations surrounding the Volcker Rule she is creating a real problem for herself if she doesn’t do it. Presidents usually make good faith efforts to implement their campaign promises, because politics is fundamentally a public undertaking. When you say you are going to do something, you probably have to try to do it and the more publicly and prominently you make the promise the harder it is to slip out of. Something said in private to Goldman Sachs is, by contrast, cheap talk. The unquestioned premise is that the potential voter believes the public statement, while the bankers -- paying big money to be in the room -- know they're being had! The point is that the Trump tape was a rare time in which the public got information about the private Trump, and it's led them (or people sensitive to the public's revised opinions) to a more negative view of him. UPDATE: Whereas this New York Times analysis by Michael Barbaro and Patrick Healy makes a very similar argument to the above i.e. that what changed was information about the private Trump, the ostensibly more quantitative/ statistical analysts are headed to a more abstract debate on whether we are seeing an unusually strong reaction to events (Nate Silver) or rats that were looking for any excuse to exit a sinking ship (Sam Wang). But if the event itself represented genuine news, the effort going into explaining the multiplier or casting as it as a Black Swan seems wasted. Not even sure how to react to this article, since there's almost nothing in here that's accurate. That's Obama transition official Chris Lu expressing incredulity about this Telegraph story, which is in the fine tradition established by Boris Johnson, continued in this case by Tim Shipman. But if the spirit of commerce unites nations, it does not in the same manner unite individuals. We see that in countries where the people move only by the spirit of commerce, they make a traffic of all the humane, all the moral virtues; the most trifling things, those which humanity would demand, are there done, or there given, only for money. The spirit of trade produces in the mind of a man a certain sense of exact justice, opposite, on the one hand, to robbery, and on the other to those moral virtues which forbid our always adhering rigidly to the rules of private interest, and suffer us to neglect this for the advantage of others. Can the Prime Minister say what area of agreement was found to exist between himself and President de Gaulle on the political organisation of an enlarged Community and any defence arrangements to go with it? Secondly, is the Prime Minister seeking to ensure that there are clear solutions to such problems as he mentioned, like the sterling area and international indebtedness, before he decides to embark on negotiations? On the latter question of the sterling area, I think I should say that there was a very clear attitude on the part of the French Government about the question of sterling and the parity of sterling which helps to clear up a lot of misunderstandings about the French position of last year. So far as that is concerned, most of the issues raised are matters for the I.M.F. and the Group of Ten and for discussion in other directions. I felt, however, and I was not surprised to find, that there were feelings which, I think, are based on misunderstandings about what the sterling area is about, what sterling balances are and the position of sterling as a trading currency. We did everything we could in the time to help to reassure French doubts about, as they would perhaps feel, the irreconcilability of sterling as an international currency with what we were talking about, namely, Britain's relationship to Europe. Today there is little awareness of South Sudan’s continuing catastrophic collapse or the Central African Republic’s civil war. Above, George Clooney and Don Cheadle along with journalist Brian Adeba present a report on South Sudan's corruption before heading to the State Department and White House to discuss the South Sudan situation with John Kerry and Barack Obama. Ironically, despite underplaying the attention given to South Sudan, the NYT analysis gets right why another Sudanese war could rise above the noise -- the Darfur war was easily portrayed as against the evil Omar al-Bashir, President of Sudan. But once he went out of the picture in South Sudan, with independence, the narrative became more complicated and ultimately less interesting. But anyway, the South Sudan case is worse than that. As Zach Vertin pointed out in the Washington Post right after Clooney's DC visit above, South Sudan is a case study not in lack of attention, but the wrong kind of attention: a favoured bipartisan/celebrity cause for so long that its advocates only started noticing recently that something had gone very wrong, when the rot actually set in years ago. And whereas everyone eagerly looked for a new African story in South Sudan, Syria was just classified as another iteration of a Middle East war, ultimately not worth doing anything about. Attention does not equal action. Reuters -- Colombians rejected a peace deal with Marxist insurgents in a referendum on Sunday, plunging the nation into uncertainty and dashing President Juan Manuel Santos' dream of ending the 52-year war. The surprise victory for the "no" camp - by less than half a percentage point - was likely to shatter a sense of international jubilation - from the White House to the Vatican - at what appeared to be the end of the longest-running conflict in the Americas. The fundamental reason that the referendum was close culminating in the defeat was a sense of injustice. It didn't help that global policy elites parachuted into Cartagena last week to celebrate the signing before the deal was done, a complacency reflected in the fact that news outlets in the USA completely missed the emerging shock on Sunday evening. 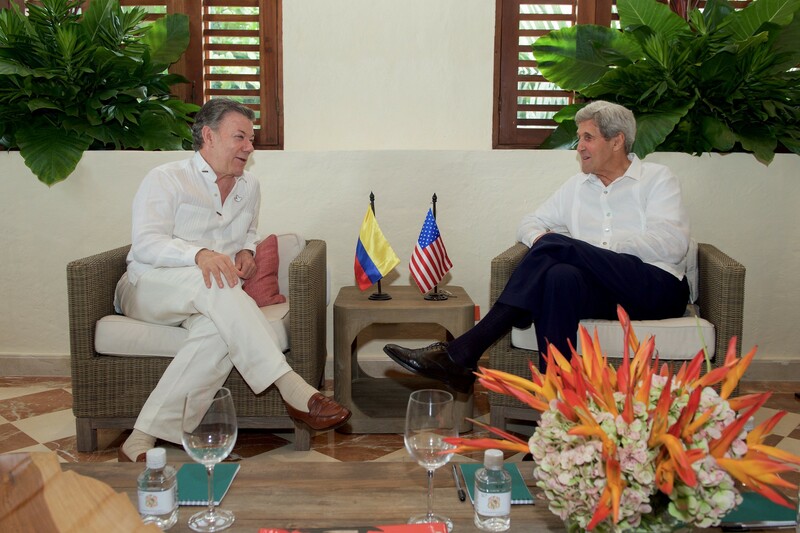 Above, US Secretary of State with the Colombian President during his visit, which he squeezed in between attempts to salvage the Lavrov-Kerry Pact in Syria. The White House seems to have a theory that after Assad and Putin are done turning Aleppo into Grozny, everyone will just come to their senses and do a deal. Colombia shows that at the level of the actual voter, the sense of grievance left by externally celebrated peace agreements plays out very differently, when it's allowed to. "It's instructive to go back to the early stages of the subprime market, which has essentially emerged out of CRA." Mr. Greenspan. Well, you know, it is instructive to go back to the early stages of the subprime market, which has essentially emerged out of the CRA. The evidence now suggests, but only in retrospect, that this market evolved in a manner which if there were no securitization, it would have been a much smaller problem and indeed very unlikely to have taken on the dimensions that it did. It wasn't until the securitization became a significant factor, which doesn't occur until 2005, that you have this huge increase in demand for subprime loans, because remember that without securitization there would not have been a single subprime mortgage held outside of the United States; that it is the opening up of this market which created a huge demand from abroad for subprime mortgages as embodied in mortgage-backed securities. Now, we didn't know that the deterioration in the standards was occurring until 2005, because you look now at the outstanding subprime mortgages and it is very obvious that those that were made in 2004 and earlier have not turned out to be an incredibly difficult issue. In other words, the real toxic mortgages occur with the huge increase in securitization and largely the demand from abroad and to whatever extent Fannie and Freddie were involved, from them as well. He's quite clear. He's not a huge fan of the CRA, but even with his view that it did lead to some marginal mortgages, on its own it was not a big factor. It was only the broader factors of securitized mortgages and the mid-2000s piling-in by foreign investors -- under no US pressure to buy anything -- that metastasized the market. But Gramm keeps using that single sentence quote, now to argue against institutional financing of public infrastructure investments. In a few short years, he had amassed $3.4 billion in debt — personally guaranteeing $832 million of it — to assemble a portfolio that included three casinos and a hotel in Atlantic City, the Plaza Hotel in Manhattan, an airline and a huge yacht. Trump amassed huge assets far beyond his original cash flow through debt; when those assets collapsed in value, he could take deductions as the owner while sticking creditors with big losses. All possible because of the distorted incentives created by debt finance interacting with the tax system. With Shariah-compliant finance, everyone would have to be clear at the start about the sharing of risk and how it would be shared. It's why some serious economists think all property investments should be done through Islamic finance. 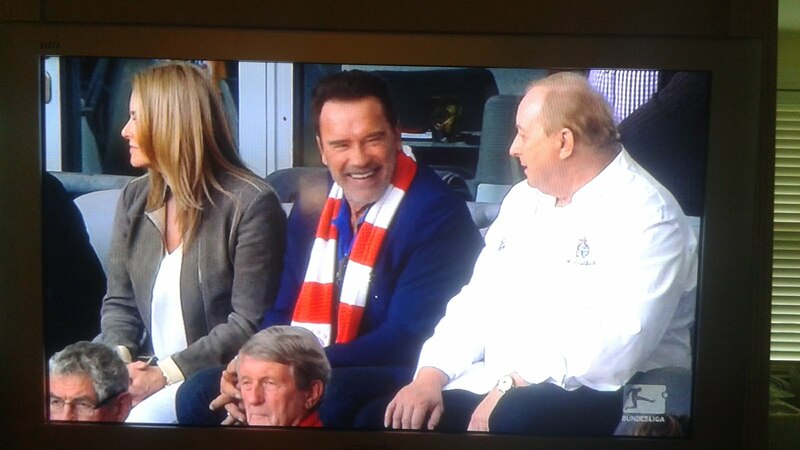 Arnold Schwarzenegger at the Bayern Munich vs Cologne match today in which Bayern Munich were held to a surprising draw. Maybe he's in the country for a stern talk with Deutsche Bank executives.